Are GMOs Killing Monarch Butterflies? The population of Monarch butterflies declined sharply this year. In Iowa, they have seldom been seen, even among people who preserve their milkweed plants for the orange and black insects to feed and reproduce. According to official counts, the population declined by as much as eighty percent in Mexico this winter. During a recent interview, Orley Taylor— founder and director of Monarch Watch, a conservation and outreach program— talked about the factors that have led to the sharp drop in the monarch population. Among them, Taylor said, is the increased planting of genetically modified corn in the U.S. Midwest, which has led to greater use of herbicides, which in turn kills the milkweed that is a prime food source for the butterflies. Why Monarch Butterflies’ Numbers are in Freefall by Vidya Kowri. The Monarch Butterfly Decline, and What You Can Do About It by Matt Miller. Tracking the Causes of Sharp Decline of the Monarch Butterfly by Richard Conniff. This entry was posted in Environment and tagged environment, GMOs, Monarch Butterflies, Roundup Ready Corn, Roundup Ready soybeans. Bookmark the permalink. 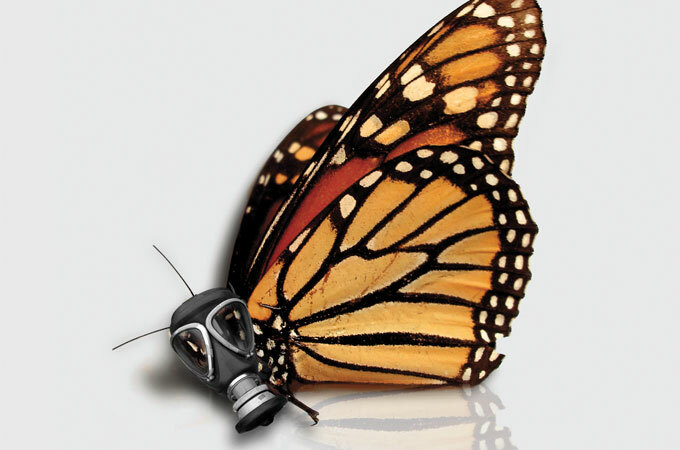 1 Response to Are GMOs Killing Monarch Butterflies? Thanks for posting the link to my monarch butterfly blog. I’ll be visiting Iowa next week!